May Activity – Reminder to all Members that this has been shortened to 2 weeks and will run from 1st May to 14th May inclusive. There will be no nets during this activity. For full details check out the Awards and Contests rules on the link shown below. Logs:- To include TIME of QSO, CALL SIGN of station worked, RST Sent / RST Received, NAME, QTH, RSARS Number Received. Logs not submitted correctly will be returned to the claimant for completion, time permitting. A Summary Sheet fully scored must be completed and submitted with the log. The Log Sheet and Summary Sheet can be downloaded from the Society website or an S.A.E. to the Awards Manager will secure you a printout. Logs and Summary Sheet to be submitted to the Awards and Contests Manager, QTHR and inside front cover “MERCURY” no later than the 20th June. Logs that are received without the Summary Sheet will be sent back to the Log owner if time permits otherwise they will be classed only as a check log. If you are in any doubt about this, please contact the Awards and Contests Manager for clarification. The RSARS Awards Scheme recognises two classes of membership: “British Isles” operating from locations within “The British Isles”, and “Overseas” operating from outside “The British Isles”. Contacts made on and after 1st August 2004 are eligible. “The British Isles” is defined as one call area. RSARS Awards are for three types of activity:- (1) General operating awards, (2) Annual achievement, and (3) Contest Awards. Trophies, plaques and certificates are awarded free of charge (except for postage) to fully paid-up members – Full, Associate or Affiliated. Awards are based upon confirmed two-way contacts in a single mode. A contact is the unassisted exchange of callsigns, signal reports, names, locations and RSARS membership numbers. Contacts through repeaters do NOT count. Claims from listeners (UNLICENSED members ONLY) must be supported by the same verification as is required from licensed members. Please ensure that sufficient Postage is included with claims for return (NOT envelopes, please, because these need to be of the correct size for each certificate). Send postage in the form of UK postage stamps whenever possible – dollar bills are acceptable from Australia, Canada, New Zealand and USA. 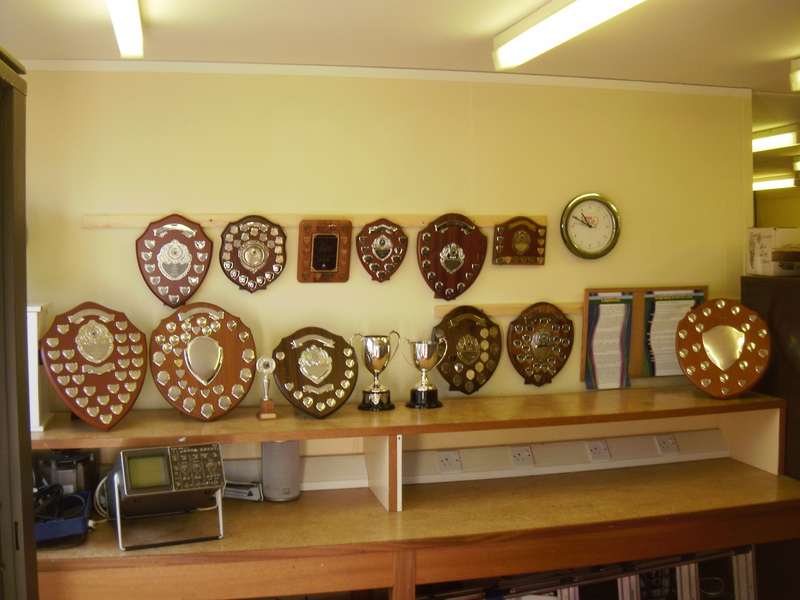 The Awards & Contests Manager will help in any cases of difficulty – Please do NOT send cheques..
Click on the picture below to see a display of all our awards which are on display in Cole Block. Annual winners of these awards each receive an individual plaque as a permanent keepsake. The following link shows a table covering all of the available awards.. When members have completed the final stage of any of the General Operating awards, certificates will be issued to carry additional stickers at the same increments as shown for each award, to recognise further progress. A Trophy to confirm contacts between a member from within The British Isles and 100 members Overseas (outside The British Isles). Additional plaques at 150 and 200 and every 50 thereafter. A certificate and trophy, for contacts between one member from one QTH only and 6 other members, one per IARU-recognised continent:- Africa, Asia, Europe, North America, South America and Oceania. (South America includes the Falkland Islands and Dependencies, and also any station as far North as the Tropic of Cancer). Endorsement for a single mode is available, if applied for at the time of submitting the original claim. Click on the appropriate link for the required information……. 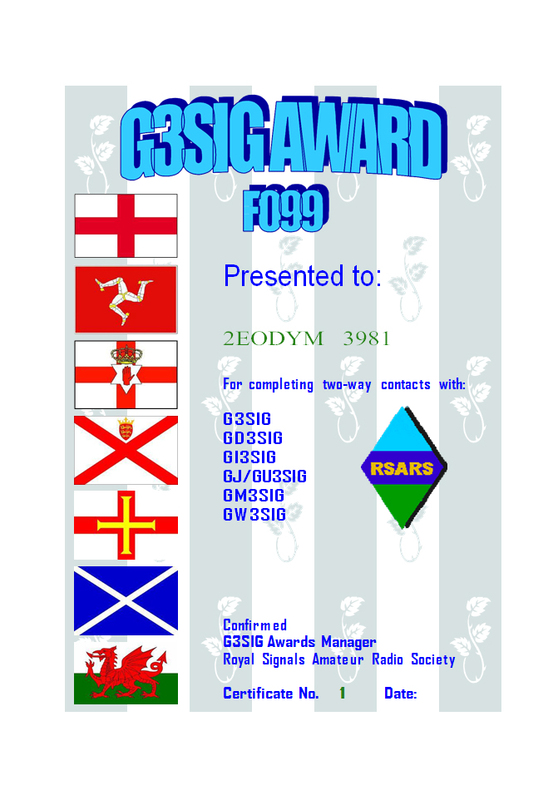 To claim The RSARS G3SIG Award necessitates working the station in each of 6 call areas of Great Britain. Successful contacts will automatically generate cards from G3SIG. Members’ cards for contact with G3SIG are not required. In order to generate more interest in this award, the original Affiliated number F005 was cancelled and the new number F099 was allocated which was effective from 1st March 2012. A new certificate was designed and members are now able to work this award again and receive the new certificate once they have worked all of the 6 UK call areas. Award statistics will be published here from time to time. This section includes links to essential documentation – ie the 50th Year Anniversary Rules and details of requirements for Claims etc. both in downloadable PDF. The Society was officially formed on 23rd June 1961 at Blandford and to celebrate our Jubilee year there will be a Special Event station GB50RSARS running for one year from the 18th June 2011. A specified number of QSOs with this and other stations are required to obtain the different levels of the commemorative Award Certificate. Although the activity has now ceased, you are still able to claim the award certificate if you have the required number of contacts.